Khaled Almbayed of Syria (2nd L) fights for the ball with Mathew Leckie of Australia during the 1st leg of their FIFA 2018 World Cup qualifier match, at the Hang Jebat Stadium in Malacca, on October 5, 2017. SYDNEY - Syria will rely on their trademark fighting spirit to keep their World Cup "miracle" alive against Australia on Tuesday, as the Socceroos look to ride a wave of home support. 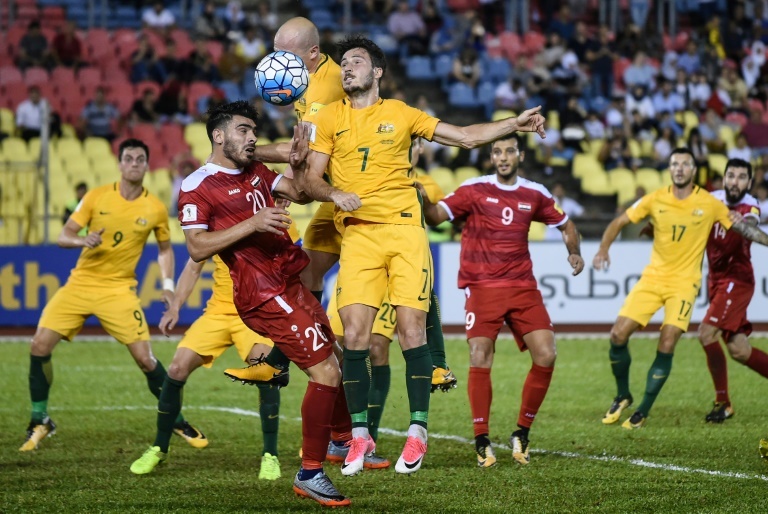 The Syrians were fortunate to grab a 1-1 draw in the first leg of the Asian play-off in Malaysia last week, courtesy of a controversial late penalty that left Australia fuming. But it was enough to maintain a remarkable qualifying campaign that has defied Syria's brutal civil war, thanks largely to a steely resolve instilled by coach Ayman al-Hakim. It now comes down to 90 minutes at Sydney's ANZ Stadium, with the winners going into a two-legged clash with the fourth-placed team from the CONCACAF federation -- currently Panama. "Our match with Australia in Sydney is difficult, and although we'll be missing five players (through injuries or suspension), we are used to playing outside of our land," said al-Hakim. "I say to our fans: what we have achieved so far is not only an achievement, but a miracle, and we will push with all our force to continue our journey on the path of achieving our dream." Striker Omar al-Soma, who only recently returned to the war-wracked team after a long absence believed to be for political reasons, said the squad didn't lack self-belief. "The draw (in Malaysia) was fair... our key for the second match will be the fighting spirit, the will, and the set pieces," he said. In a country gripped by conflict, politics are never far away and Syrian refugees and community leaders will be protesting against President Bashar al-Assad's regime outside the stadium before the game. "For the Syrian people, the 'fairytale' surrounding the success of the Syrian football team cannot hide the six-year nightmare that we've had to endure," said refugee Obau Al-Akel, who fled Damascus and arrived in Australia in 2014. The stadium has been home to some of the Socceroos' most memorable moments, including the 2005 World Cup play-off win against Uruguay that sent them to their first finals in 32 years. Coach Ange Postecoglou said home support could make all the difference to Australia, who also lifted the Asian Cup trophy in the same venue in 2015. "When 80 percent of your players play abroad, it does have extra significance when they play at home in front of family and friends and feel that sort of love from the crowd," he told reporters. "It certainly helps, and in some ways it influences what happens on the pitch with the opposition -- they feel the heat of the opposition crowd." Veteran striker Tim Cahill is the only current Socceroo to have been part of that triumph over Uruguay. The 37-year-old, who is two goals away from hitting 50 at international level, is mostly used as a super-sub these days, but Postecoglou is considering starting him in a bid shut down Syria early. "I really think the start is going to be important. We can really put the game to bed if we start strongly," he said. Australia are driven by the feeling they were robbed in the first match by the dubious penalty decision by Iranian referee Alireza Faghani that denied them a crucial advantage. The imposing Al-Soma converted from the spot in the 85th minute, cancelling out Robbie Kruse's first-half opener. Celtic star Tom Rogic, who only featured for a few minutes of the first leg, is set to play a more prominent role on Tuesday. With his ability to dribble, pass and shoot from distance he could be a potential game-changer. Australia, who joined the Asian Football Confederation in 2006, are attempting to reach their fourth-straight World Cup and fifth overall. Syria are striving to make their World Cup debut after a marathon qualifying run that has defied the raging civil war in their home country. Syria will rely on their trademark fighting spirit to keep their World Cup "miracle" alive against Australia on Tuesday, as the Socceroos look to ride a wave of home support.